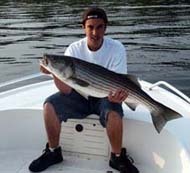 Block Island is a premier destination for striper fishing charters in the state of Rhode Island. There are many productive fishing areas located all around the island that can produce stripers from schoolies to trophy sized fish. All of our captains fish the area around Block Island very successfully, using light tackle and other tactics that make it fun to catch the fish. 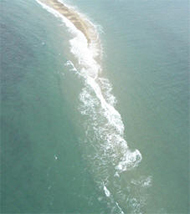 The main areas to fish at Block Island are the North Rip, west side, southwest corner, and southeast corner. All these areas can hold fish. The most popular and productive area is the southwest corner, toward the Southwest Ledge. This spot has the most areas of structure to fish over a wide area. Tide is the most important element to consider when fishing there, the tide normally needs to be running for te fish to be biting. Adventure Charters fishing with 2 vessels available sailing out of Jim's Dock in Jerusalem, Rhode Island. Fishing the Rhode Island south shore and Block Island. Captain Chris Bell, USCG licensed. Aces Wild light tackle fishing sailing out of Jim's Dock in Jerusalem, Rhode Island. Fishing Block Island and the south shore. Captain Earl Bell, USCG licensed. Drifter Too Fishing Charters sailing out of Jim's Dock June 1-October 1st, Captain Richard Chatowsky USCG licensed. Richard has fishied Rhode Island and Block Island for 40 years. On The Rocks Charters boat is trailered anywhere on Narragansett Bay or the RI South shore including Block Island. Occasionally Rene picks people up at Jim's Dock. Snowfly Charters located in Bristol May-June, Block Island in late June-September, and Jim's Dock in Jerusalem during October-November. Captain Greg Snow, USCG licensed.